As a child, I remember my parents bringing the family to our favourite claypot rice Stall in Chinatown, which used the traditional method of cooking the rice directly over charcoal stoves. 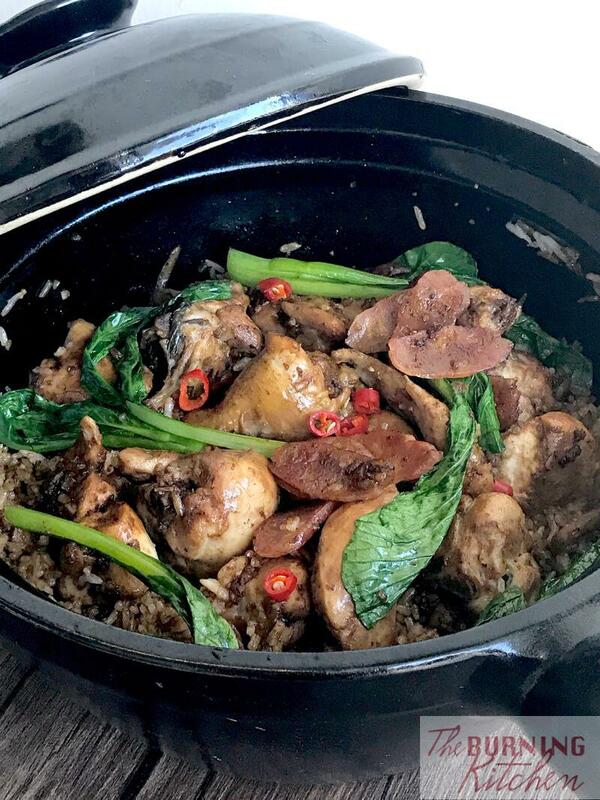 Nowadays it is much harder to find authentic claypot rice cooked this way. It took nearly an hour for our food to arrive, but it was all worth it because the charcoal flame lends a smokey flavour to the dish. As we finished the rice, there was a much coveted crispy layer of charred rice at the bottom. My siblings and I used to quarrel over who got that! Now whenever I cooked claypot rice, it brings back memories of those happy childhood days. 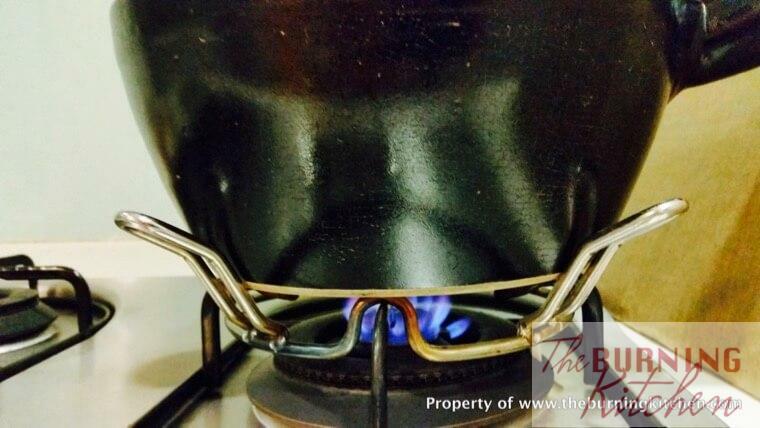 To make this dish at home, I used a gas stove with a deep pot/wok support stand (see the contraption below). This lifesaver allows me to tilt the claypot on all 4 sides and balance it on the stand. 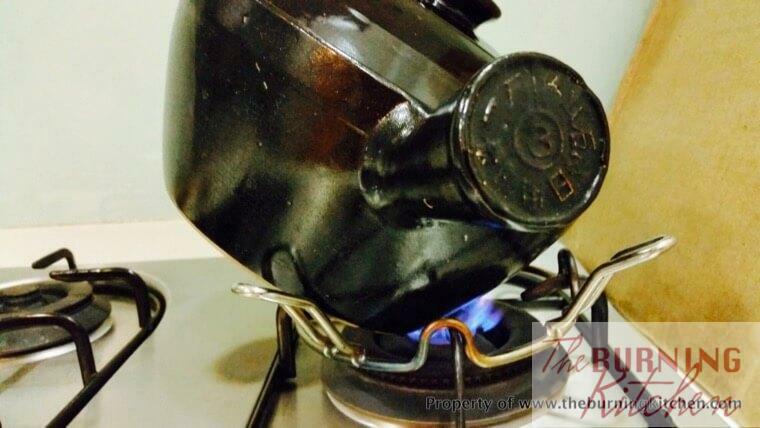 If you are using a traditional charcoal stove, you won’t need this gadget as it already comes with groves that act as a support for the pot no matter which way it is tilted. Tilting the claypot every 2-3 minutes is an essential step as it prevents the rice at the bottom and sides from getting burnt while the rest of the rice and ingredients are still cooking. 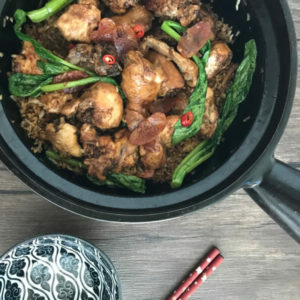 You will know that you have mastered the art of making claypot rice when you are able to achieve a golden crusty and crispy (not charred!) layer of rice at the bottom once your dish is cooked. The smoky, slightly burnt flavour of the dish, which brings out the meatiness of the chicken and the aroma of the rice. The crispy bottom layer of rice at the bottom is a great way to end the meal! 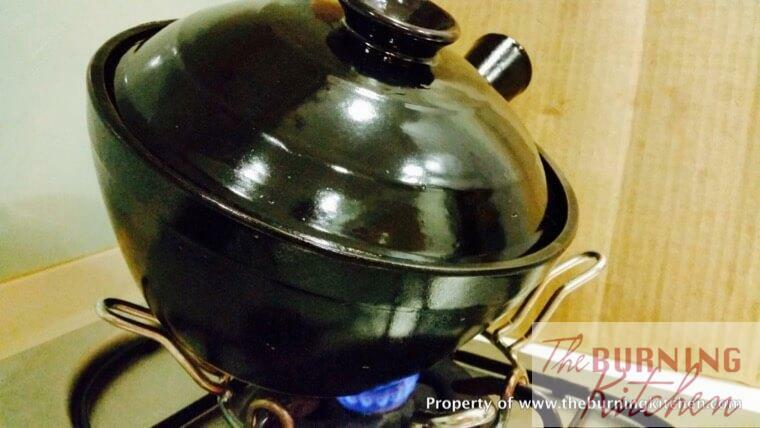 HOW TO MAKE CLAYPOT RICE? Cut the chicken thighs into bite-sized pieces and marinate with the marinade ingredients for 20 mins. 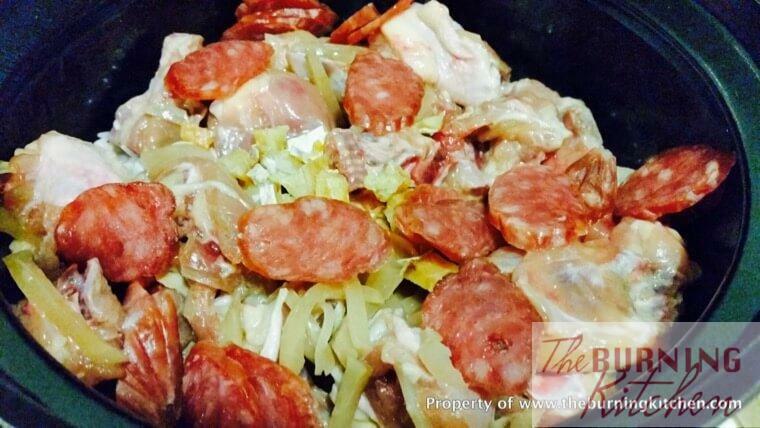 Soak the Chinese sausages in hot water for 5 mins, then remove the sausage casing and cut diagonally into thin slices. Shred the preserved radish and soak it for 5 mins to remove excess salt, then squeeze dry. Cut the salted fish into tiny pieces. Cut the spring onions into small pieces. 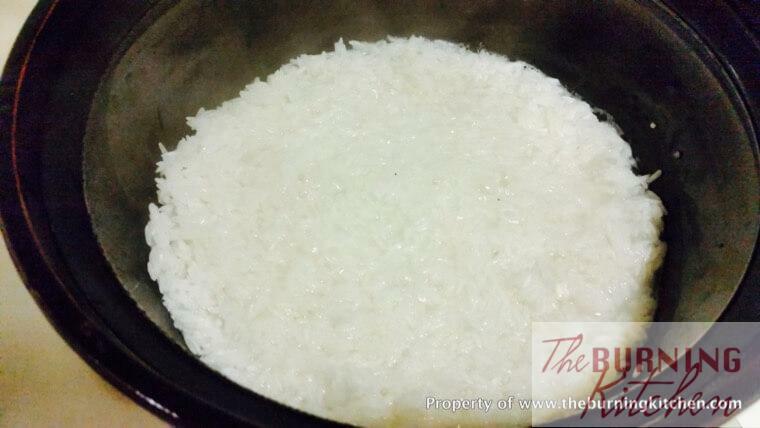 Place the rice and water in a large claypot, and add the 3/4 tsp of salt. Give the rice a stir and bring to boil over medium high heat. When the rice starts to boil (about 6 minutes), add in the chicken, shredded radish, salted fish and Chinese sausages on top of the rice. Do not stir. Instead, try to spread out the ingredient in just one layer. Lower the heat to just below medium and cook the rice for about 25 mins, rotating the claypot every few minutes by tilting the claypot on 4 sides, so that the rice at the bottom will not get burnt. 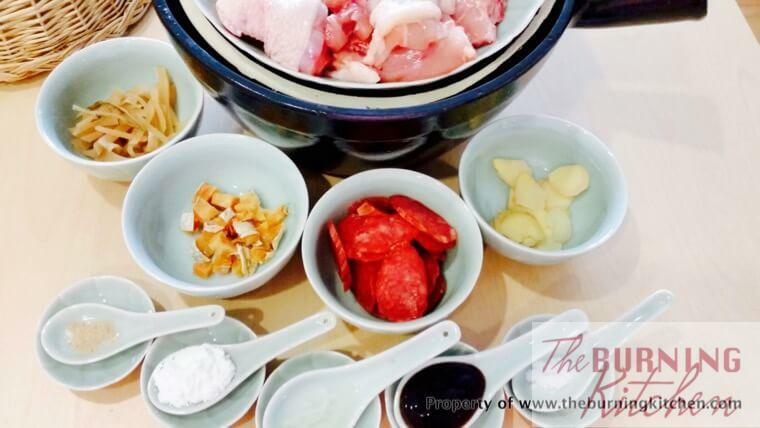 Gently stir just the ingredients in the pot but not the rice, making sure they are thoroughly cooked. Lower the heat and turn the pot straight up, then add in the Chye Sim and cook for another 5 mins. By now you will smell the smokey aroma coming out from the pot. When the rice is cooked, bring the whole pot to the dining table. 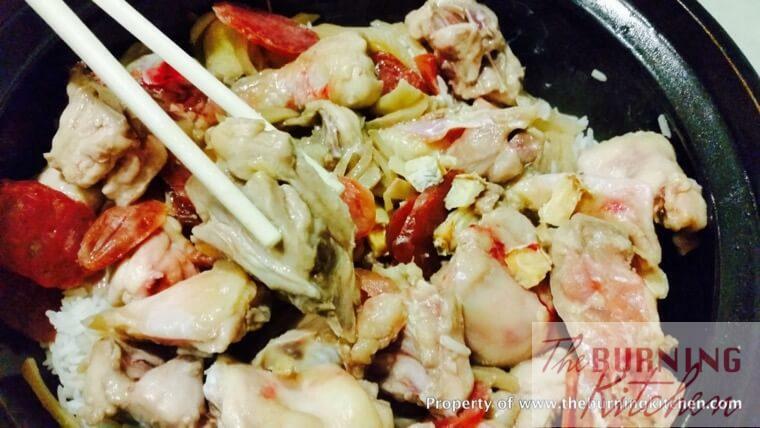 Open the lid, add in sesame oil, garlic oil and dark soya sauce and mix with the chicken. Scoop out the vegetable and the chicken mixture on the plate. Add a little more dark soya sauce to the rice and stir using a pair of chopstick. 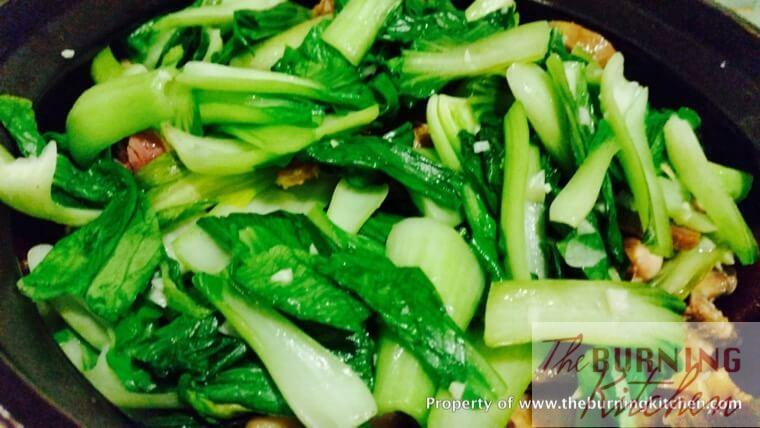 Garnish with spring onions and serve while it is hot. Get a claypot with two handles rather than one if you are buying a new claypot. I made that mistake with my last pot – I have difficulty to lifting the pot with one hand because it is very heavy. So two handles would be more ideal! Fill the claypot with water and soak for a few days before using if your claypot is new. Otherwise it will crack while cooking. Use 1/2 cups of water less than the rice amount. This is because the chicken also releases juices as it cooks to compensate for reduction in water. If you use the same amount of water as the rice, the rice will become too soggy after it is cooked. Stand by the stove during the whole process to rotate the claypot every 2-3 mins on all the four sides and on the bottom of the pot. This will enable the smoke in the pot to cook the chicken from all directions, and also prevent the rice at the bottom from getting burnt. The outcome you are aiming for is to get the bottom layer of rice to be crusty and crispy, but not burnt. Wear a pair of kitchen gloves to handle the hot pot. Fry the chicken and ingredients to about 30% doneness before adding them to the rice to speed up the cooking process. You will need to practice several times in order to control the fire well. Tilt the claypot on its side. 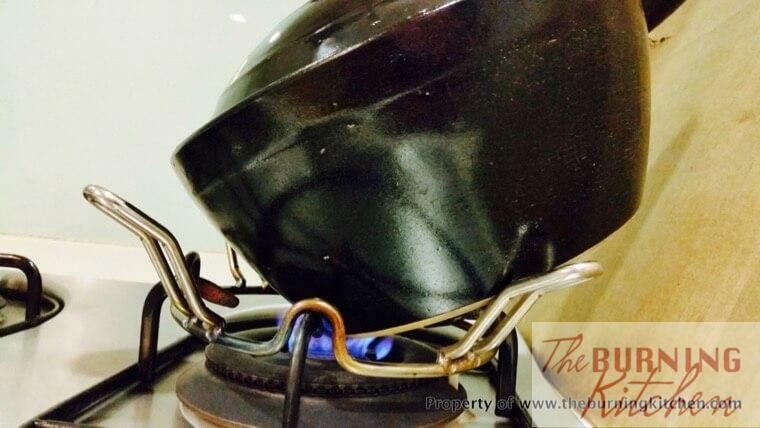 It enables the smoke inside the pot to cook the chicken thus giving it a smokey flavour. Fish-Free: Skip the salted fish. Gluten-Free: Use gluten free version of dark soya sauce. 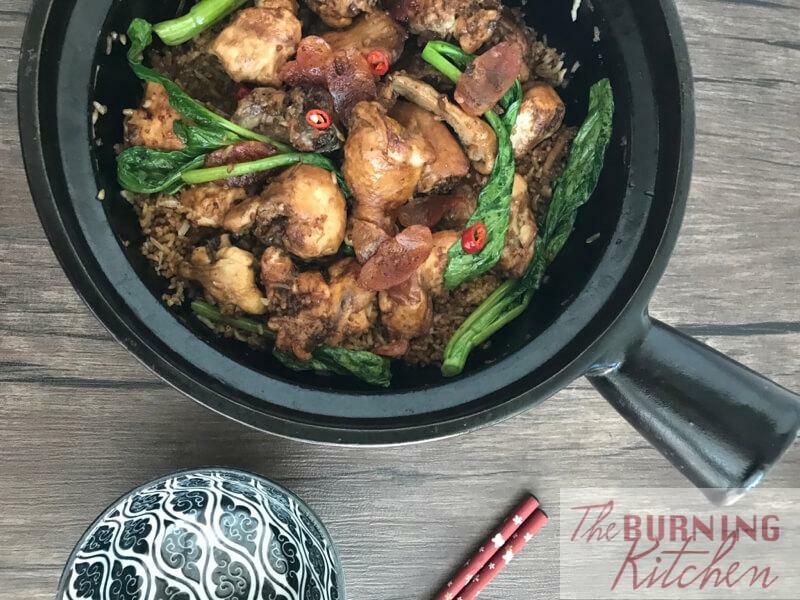 Cooking traditional claypot rice in claypot adds a special touch, infusing a smoky aroma into the dish and creating a crispy bottom layer of slightly charred rice that's great at the end of the meal! Get a claypot with two handles rather than one if you are buying a new claypot. I made that mistake with my last pot - I have difficulty to lifting the pot with one hand because it is very heavy. So two handles would be more ideal! Hi, I was wondering whether the ‘cups’ of rice is the same as the cups used for baking? Or perhaps, what is the amount of rice in weight? 🙂 Thanks. Hi Adele, it doesn’t matter what cup of measurement you use, just add 1/2 cup of water less when cooking the rice becos the juices from chicken, during the cooking process will come out thus making it just nice for the rice. Otherwise the rice will be too soggy at the end of the cooking process.